Isson Tanaka (1908-77) was deemed a painting prodigy on winning a children’s art competition at age 7. By age 50, however, his career had slowly gone nowhere. Giving up his Tokyo environs, he burned his numerous sketchbooks, sold his houseand headed south to Amami Oshima Island, Kagoshima Prefecture, in the Ryukyu island chain. He lived in near poverty, minimally supporting himself by dyeing fabrics, as he developed a brightly colored painting style known as Southern Rinpa that posthumously captured the nation’s heart. Isson was trained by his sculptor father in the indigenized Chinese aesthetics of literati painting known as nanga. 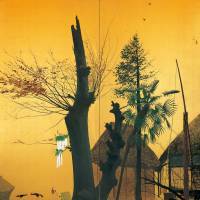 In 1926, he attended the Tokyo Fine Arts School (now Tokyo University of the Arts), where his classmates included the luminary postwar painters-to-be Kaii Higashiyama and Meiji Hashimoto, but dropped out after a couple of months owing to family issues. Thereupon, he pursued individual study, deepening his knowledge of Chinese poetry and calligraphy, and following the creative leads of Shanghai School painters, such as Wu Changshuo (1844-1927), whose influences are visible in “Gourds” (1926), one of Isson’s paintings on display at the Sagawa Art Museum’s current exhibition. The Chinese inscription on Isson’s “Peonies” (1928), also on show, was made at a time when the general public no longer appreciated such “foreign” scripts, leading Isson to partly abandon the Chinese aesthetic. By 1931, he had moved to a crisper and more colorful realism and dropped the Chinese textual citations. During and early after the war he painted Buddhist themes, bird-and-flower imagery, and landscapes with evocative atmospheres, such as “Dusk” (1948), which aped the appearance of Western oil painting. Japan’s status-conferring art institutions, however, did not warm to his visions. His single triumph was being selected for the 1947 Blue Dragon Society exhibition. He next worked on large-scale and decorative Edo Period (1603-1868) Rinpa-inspired paintings, including the gold leaf panels of “Clear Autumn Day” (1948), depicting a farm-house with daikon radishes drying on a tree. Yet his subsequent submissions to Tokyo’s two major exhibition forums, the Nitten and the Inten, were rejected. Ignored and disappointed, Isson left the capital in 1958. 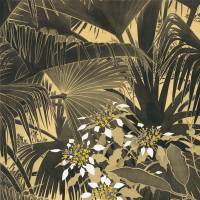 In Amami, he studied and sketched the tropical forest floors and canopies, forging a romanticized world of a paradise recovered that later led to him being called Japan’s Paul Gauguin. Isson’s tropics were brightly colored, graphically stylized and in cases like “Seashore with Screw Pine” (1969), occasionally bordered on tourist kitsch. His exotic island scenes were populated with unusual flora and fauna, but nonetheless retained a feel for nanga, its subjects and vivid brushwork. Upon his death, Isson’s popularity grew. Small-scale exhibitions were arranged, Kagoshima NHK aired a program calling him the “phantom painter” and he became the subject of NHK’s nationwide Sunday Art Museum program in 1984. Public adoration swelled and his oeuvre was assembled and published, followed by a touring exhibition in 1985. Another show in 1995 visited 19 cities, and a memorial museum was erected in Amami Park in 2001. This year, as the Sagawa Art Museum celebrates the 110th anniversary of his birth, Isson was also finally introduced overseas, his work being shown outside of Japan for the first time as part of the “Depth: A Plunge into Japanese Aesthetics” exhibition in Paris. “Tanaka Isson: 110th Anniversary of His Birth” at the Sagawa Art Museum runs until Sept. 17; ¥1,000. For more information, visit www.sagawa-artmuseum.or.jp.